We’d love your help. 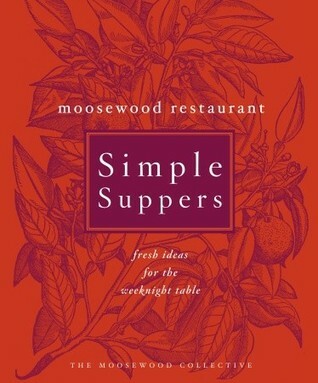 Let us know what’s wrong with this preview of Moosewood Restaurant Simple Suppers by The Moosewood Collective. Whole grains. Fresh fruits and vegetables. Lean, nutrient-rich fish. We all know the virtues of a well-balanced diet—of choosing foods that nourish our bodies and respect the environment—but as the world around us gets busier and more complicated, we also know how difficult it can be to prepare a wholesome Eating the Moosewood Restaurant way every day has never been easier. 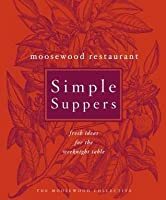 To ask other readers questions about Moosewood Restaurant Simple Suppers, please sign up. This is a great cookbook with some real winners, but also some so-so recipes, and a few ridiculous recipes, like "corn on the cob" or "fresh tomato salad," which is chopped tomatoes with basil and fresh mozzarella tossed with olive oil. I make that all the time in the summer and never considered it a "recipe." I guess they aren't kidding when they titled this "simple"! My daughter made this for her school lunch, and raved about it. I neither made it nor a This is a great cookbook with some real winners, but also some so-so recipes, and a few ridiculous recipes, like "corn on the cob" or "fresh tomato salad," which is chopped tomatoes with basil and fresh mozzarella tossed with olive oil. I make that all the time in the summer and never considered it a "recipe." I guess they aren't kidding when they titled this "simple"! My daughter made this for her school lunch, and raved about it. I neither made it nor ate it! It's basically steamed broccoli and fresh tomatoes tossed with a simple balsamic & olive oil dressing. Sounds like this is a "make again" recipe. Lily made this for her lunch and said it was too sour, she added extra plain yogurt to improve it. This was amazing, and (once we got the blender to spin against the cooling, gardening chocolate) very easy. We will definitely make this again. I thought this was fantastic!!! I will definitely make this again ... on a night when I'm only cooking for myself because I was the only one who liked it. (Recipe says this "will please even the tofu-phobic" and that turns out to be false. Daughter #2 wouldn't even try it. Her loss, my gain, more leftovers for me!!!) Recipe calls for 10oz of baby spinach but Wegmans sells 8 oz bags, so I threw in a few chopped baby bok choy, this was excellent. This was good, but too oily - next time make with half and half instead of heavy cream. We added half a bag of baby spinach and a bag of baby arugula. It needed the greens. Extremely simple and not impressive. I've never baked quesadillas before, and I won't do it again. We used black beans instead of refrigerator beans, because refried beans are gross. I wasn't crazy about the salsa cooked IN the quesadilla either. I thought this was fantastic!!. My kids weren't so crazy about it. I used basil instead of parsley because Lily doesn't like parsley, and topped with plenty of Parmesan. It would be even better with some pine nuts. Boring name but a good meal! I was the only one who really liked it, though. We used endive; I would make this again, and it might be interesting to try with different greens. This was fantastic! I am learning that I really like recipes with coconut milk (which is a surprise, because I don't like coconut). I also realize now that I forgot to add the basil - oops!! It was a little watery, not sure how to fix that (maybe use less coconut milk?). Served over rice, we got four servings, just like the book says. We will definitely make this again, we all loved it. Meh. It was okay. It was really simple, though! The two of us ate it all, so "2 servings" is accurate. We weren't quite sure HOW to eat it though ... roll it up like a burrito? cut it in pieces and eat with a fork? I ended up folding it in thirds like an enchilada and slicing it up. Extremely simple. Basically just toss cooked green beans with lemon juice and olive oil. (And it was too much lemon juice.) This would be a nice way to prepare vegetables if you like your vegetables with lemon. Which I do not. We served this with Sesame Broccoli and (gasp!) grilled sausage. The confirmed vegetarian in our family had a (homemade) veggie burger. Basically, potato salad made with the chipotle mayo recipe in this book, which is mayo + canned chipotles in adobo sauce + lemon juice (and it was kind of annoying that these recipes were not on the same page). This was very good, and pretty easy, a nice twist on the classic potato salad. I even liked the chopped red bell pepper in it, and I don't usually like peppers. It would be good with some corn added, too. We will probably make this again. When I looked at this recipe, it did NOT look very good! I mean, fried rice with eggs, soy sauce, and chili paste, sure! But with bok choy and spinach and corn??? I was skeptical. Those things didn't belong in my fried rice. But my daughter (who doesn't like eggs) chose this recipe, and she made it for us, she said it was pretty easy, and all three of us loved it! We will definitely make this again. It says serves 4 and that's how many servings we got. This (like the green fried rice) is featured in the "main dish grains" section, but I think this recipe would be better as a side dish, maybe at a potluck. Or it needs to be revamped, add some zucchini and grape tomatoes, perhaps. Something. It was good, but I didn't want a whole plate full of just this. This was good but not amazing. We had this on udon noodles. Next time I make it I'll cut the amount of fish in half, because I don't like fish leftovers, and we can't eat 1.5 lbs of fish in one setting!! I should have thought of that before. Wow this was so good!! And surprisingly fast to make! I will definitely make this again. In fact, I think this recipe sold me on buying the book. Dear Library, I can return your copy! Fun to browse, and the recipes I've tried so far have done what they've said on the tin - flexible, tasty, and not too time-consuming. A keeper! This is very usable book. I have worked my way through almost 70 of the recipes and all have been fairly easy to prepare and satisfying to my family. Our favorites include Creamy Lemon Pasta, Jop Chai, Caesar Salad with Tofu Croutons, Spinach-Cheese Burritos, and the super-delicious Cilantro Lime Dressing. This book is ok. I appreciate that the recipes are simple and usually result in a minimal amount of clean-up afterward, however I think that in some cases adding another pot or pan to the clean-up could have resulted in a better recipe. A few of the recipes I made were awesome; I made them multiple times and they were great every single time. A few recipes were abject failures, either by my own fault or because the recipe was just a flop. This soup is so good! This book is ok. I appreciate that the recipes are simple and usually result in a minimal amount of clean-up afterward, however I think that in some cases adding another pot or pan to the clean-up could have resulted in a better recipe. This soup is so good! Especially served with toasted rye or pumpernickel bread. Mmm. The lemon juice adds a nice tang to it. I found it to be a bit much when the soup was served fresh but thought that it became milder after a few days. It's good either way, though, and this is a simple recipe that just "works". It has a complex combination of flavors, but uses only a few ingredients and is very simple to prepare. I used dried dill instead of fresh, and I think it came out wonderfully. I misread the name as "Broccoli" originally and so bought broccoli to make these sandwiches. Broccoli works fine but I guess if you can find this "Broccolini" creation in your supermarket, go for it. These sandwiches are really simple, filling, and tasty. I made this recipe a few times and it's a keeper. Really simple but delicious and hearty. This probably sounds like a complete abomination, but let me tell you...it's good. And really simple. It's essentially coleslaw, tomato, and swiss cheese on toasted rye or pumpernickel bread. I hate coleslaw, but loved these sandwiches. I made up a full batch of the cabbage/dressing recipe and kept it in the fridge to make sandwiches over the course of 3 or 4 days. It kept pretty well and made for easy prep. I think it's the sloppiness of these sandwiches that's so reminiscent of a "real" reuben, not necessarily the flavor...but regardless...it's really good. This recipe sounded absolutely delicious and I couldn't wait to make it. Now I have a giant bowl of leftover pasta in my fridge and I have a sinking feeling that most of it is going to end up in the trash. There are a few reasons for this. One pound of pasta is just way too much in comparison to the amounts of the other ingredients. The pasta to other-stuff ratio is just...off. Second of all, the recipe instructs you to add a cup of hot pasta-water to the feta and whisk until smooth. I found that achieving a smooth consistency was quite simply impossible. I'd much rather have made an extra dish to clean by using a small sauce pan over low heat on the stove instead of mixing it in a bowl--it probably would have worked better. Third, there just seems to be something missing. Some other vegetable or spice or...something. It's just a whole lot of pasta (too much pasta), artichoke hearts, and some cheese basically. It needed something else. This recipe was probably a failure because of my own errors, not necessarily by any failure of the recipe itself. It came out pretty horribly, and again, I have a feeling the leftovers are not going to be eaten by anyone. First of all...am I the only one who has no idea what the heck "white beans" are? I stupidly bought a few cans of beans that were literally white, but upon further research on the internet later discovered that white beans are not necessarily WHITE beans. So there was my first problem. I'd have appreciated a note somewhere in the recipe listing the types of beans that would be suitable. Second of all, I don't own a blender so that part of the instructions kind of got thrown out the window and I mashed the beans with a fork instead. It worked alright but after baking, the results were just not good (although it smelled great, which gave me hope...false hope). This soup was easy to prepare and serving it over arugula was kind of novel and made me feel fancy and sophisticated. This was another recipe that I felt was just too simple, however. The actual soup is basically composed of 2 main ingredients, red beans and potatoes. It gets old after about 4 bites. The lemon juice also adds a tangy-ness that I didn't think was great for this particular soup, especially if served with parmesan or romano cheese as recommended--it's just a little too much considering the very subtle earthy flavors of the beans and potatoes. Not that great, but at least the scant leftovers will likely be consumed rather than trashed. So many good ideas! You really can eat delicious freshly-cooked meals every day. Some recipes are high in fat and/or simple carbs, but you can always adjust the ingredients. Had this from the library and really wanted to keep it. Got actual ideas for weeknight meals, and everything I've tried has been good and family-friendly. I am not a vegetarian. That is probably why I can't rate this book any higher. It tried to use corn on the cob as a recipe which I think is ridiculous. And - vegetarian reuben????? I love quick, simple, delicious vegetarian food. This cookbook has many recipes that are go -to regular dishes that I prepare. I'm loving this book. I've already made Nachos Grandes, Broccoli Slaw, Chipotle Scrambled Eggs, and Poached Huevos Rancheros. I have many more recipes on my to try list. I'm looking forward to more delicious simple suppers and even a few breakfasts (which of course can also be served for supper). Moosewood Restaurant's emphasis is in cooking with wholesome, fresh foods so this book even has recipes that are healthy. It doesn't contain nutritional values but it does give you menu and serving ideas with each recipe. For instance; it suggests serving the Nachos Grandes with the Broccoli Slaw, which I did and they were great together. You'll find quiet a few recipes inspired by different cuisines (which I love). Cuisines like Asian, Mexican, Indian., Italian and Greek to name a few. I've found most of the recipes require little work as suggested by the title simple suppers and use ingredients easily found at most supermarkets for the most part. The recipes are mostly vegetarian as with the other Moosewood books. There are some fish and egg recipes as you'll probably notice from the chapters included. Chapters included in this book are: Pasta; Sautes, Curries & More; Beans & Tofu; Egg Dishes; Main Dish Grains; Main Dish Salads; Soups; Sandwiches, Wraps & Rolls; Fish; Side Grains; Side Dishes; Side Salads; Dressings, Condiments & Seasonings; Sauces & Spreads; Desserts; The Well-Stocked Pantry; and finally a Guide to Ingredients, Tools & Techniques. My current favorite cookbook. I wasn't going to mark this as read until we'd done the whole book, but since we're being more seasonal with our produce these days AND there's a whole seafood chapter, that's never going to happen. I've done about 15-20 of the recipes, and all have been excellent. And easy. And filling. And they make a point of using some of the same ingredients a number of times, to go along with their suggestions for a "well-stocked pantry." Possibly this would be boring for an e My current favorite cookbook. I wasn't going to mark this as read until we'd done the whole book, but since we're being more seasonal with our produce these days AND there's a whole seafood chapter, that's never going to happen. I've done about 15-20 of the recipes, and all have been excellent. And easy. And filling. And they make a point of using some of the same ingredients a number of times, to go along with their suggestions for a "well-stocked pantry." Possibly this would be boring for an experienced cook who's fairly creative in the kitchen, but for someone like me who sits there going, "oh, crap, what are we going to have for dinner *this* week," it's fabulous. I especially appreciate that the vast majority of the recipes are main dishes. There are some sides and desserts, but they're a minority. I cannot reccomend this book enough!! I cook a lot and I'm vegetarian. Also, like most of the world, I'm pretty freakin' busy, but I don't think that is an excuse to not eat home-cooked meals. Enter this cookbook. Not only are the recipes pretty great, but they have also given me all sorts of ideas on how to make other things faster. If you aren't vegetarian, don't worry. There is a whole chapter on fish and most of the recipes could have chicken or some other meat added in. I highly recommend th I cannot reccomend this book enough!! Not my favorite of the Moosewood cookbooks. I bookmarked several recipes to try, like the Asparagus Avgolemono soup or the Green and White Bean Gratin. Some of the recipes do call for unusual ingredients but they were few and far between. My biggest pet peeve was the recipe for Broccoli Slaw. Doesn't quite seem like a recipe to me to take pre-packaged broccoli slaw and add oil and lemon juice. But at least a handful of recipes caught my eye. However, I'll probably stick with some of the other coo Not my favorite of the Moosewood cookbooks. I bookmarked several recipes to try, like the Asparagus Avgolemono soup or the Green and White Bean Gratin. Some of the recipes do call for unusual ingredients but they were few and far between. My biggest pet peeve was the recipe for Broccoli Slaw. Doesn't quite seem like a recipe to me to take pre-packaged broccoli slaw and add oil and lemon juice. I really enjoyed this collection. An experienced, confident cook might find it all a bit boring, but I highly recommend it for those who, like myself, consider themselves incompetent in the culinary arts. All of the recipes I've tried so far have been simple enough, but not at the overwhelming expense of taste. Many required less than two ingredients I didn't already have in my pantry/fridge. Under normal circumstances, I'd give it three and a half stars. Feeling generous, I rounded up. If you like to go meatless regularly, this is an excellent book. Both for simple, flexible recipes and for endless ideas. We've had it for a few years, have made most of the stuff in it, and we still go back to it and make something from it at least once a week. This week we finally made the Spinach Cheese Burritos. Simple, fantastic, and soon to be a staple. My favorite cookbook! It is vegetarian, and the recipes are truly "simple." My husband asks me to cook from this book over and over. He loves it, too. Some favorites: Spinach Cheese Burritos, Navajo Stew, Mango Coconut Sorbet, to name a few. A good basic cookbook from the renowned vegetarian cooperative, Simple Suppers is indeed simple and would be very helpful to inexperienced chefs with simple palates who are trying to find their vegetarian "sea legs." The recipes we not restaurant menus! Very basic 2-3 ingredient things that any beginner cook could figure out without this book. The tofu recipes were unique, but otherwise, don't waste your money. I heart this cookbook. It has the tasty, vegetarian foods that you love from Moosewood, but without the bjillion ingredients. I especially love the Indonesian Cabbage and Sweet Potato soup. I know it sounds funky, but it is soooo good! I love this cookbook! Someone at work recommended it to be and I bought the e-book and the hard copy. Everything I've made so far is very easy to make and tastes delicious! It's the best cookbook in my collection. I've made three recipes from the book so far: potatoes with lemon & capers, broccolini cheddar melt, and spinach cheese burritos. We've loved them all! I'm reading a library copy but would like to own this one. I've used this book for every recipe I made this summer. It's that versatile. All the tastiness of a Moosewood cookbook, but the ingredient list doesn't read like a witch's potion. You can actually find the ingredients in a regular supermarket, and they're not too expensive. Probably one of my favorite cookbooks ever, but then again it's pretty hard to go wrong with Moosewood. I will say that this book has more ingredients that I tend to keep around and so is easier for me to use! I read cookbooks when I can't concentrate on a plot. This particular cookbook is lovely to read and has lots of pretty pictures. Written by the folks at the Moosewood Restaurant, it focuses on recipes that are simple and easy to prepare for everyday dinners at home.